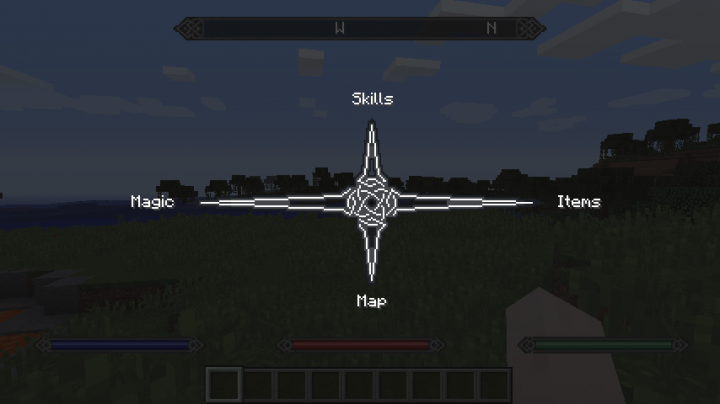 This mod will ultimately bring as much of the Skyrim world to Minecraft as possible. It will eventually contain an RPG realm; where players can play one of the most exciting games in another amazing game, Minecraft! 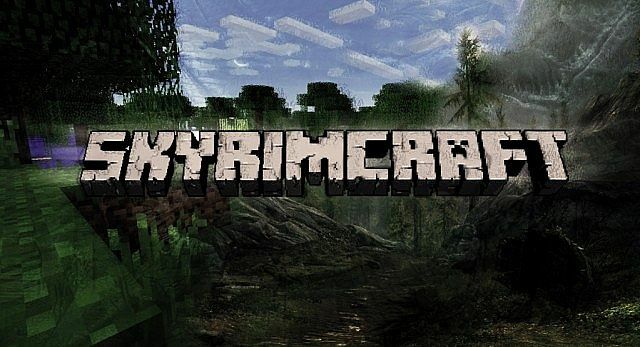 While it's state may not include everything you are looking for, we can assure you that Skyrimcraft will overhaul your gaming experience bringing the realistic Skyrim world to life inside a 3D blocky landscape. We hope you enjoy this mod just as much as we enjoyed making it. Hows it going? It's been a while since we heard anything. u still developing this mod? doubt it, this seems supremely dead for good. Haha i had no idea! Will do that! Yeah we will eventually add most of the mobs into the game! Let's not get too far ahead of what the mod already is, that's how it went downhill last time. So we're just focusing on the structure and base of the mod first before adding anything special. When will the download be available ? We will release an alpha soon. Don't expect it to be in the next couple of days because we're coming up with ways to bring the most to you in our own way, rather than the complete Minecraft way. This mod looks absolutely incredible. I would be happy to offer some textures for this, if you still need an artist! Sure, I could do that! I actually have a lot of assets I made for a Skyrim-based mod that never really saw the light of day, as well; I'd be more than happy to send those if you'd like. What type of file setup do you want for the armors? I can try to make some, but I don't know anything about the modding side of things. Imagine This Mod Fully 100% Complete? With Everything! Haha! I'm glad you're happy! 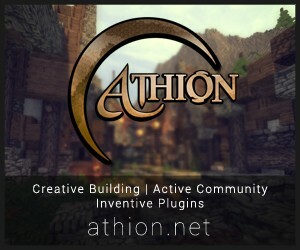 We should be releasing some early alpha builds soon enough for testing. OMG OMG OMG YES PLEASE!!! Khajiit has diamonds if you have coin. I hope this will turn into something reaally good. Maybe add custom models for the armor? Rather than the regular squares over the player. Similar to what Thaumcraft does. Yeah that will be happening. First I need to find a modeler and texture artist for those! Well, I can make models for these, and actually will be making some pretty soon. I could let you use some of them in return for a favor. Can you add a custom waypoint system where you're waypoints would show up as the waypoint arrow in actual skyrim? Also, make them show up on the compass? Yeah ill give that a go! This is amazing! Keep working on it! nice, but you should ask any good skinner to make your armor better, cause this one looks silly. also good job, i really like it. Yeah I'm looking for texturers and modelers! This mod looks awesome, being a Skyrim and Minecraft fan, a mod that combines both is, imo, best thing ever. There is a Minecraft comes Alive mod for 1.9, I don't know if this mod would be able to become compatible with it. That mod has the feature of marriage to NPCs like the Elder Scrolls brings. This mod may or may not have anything to do with the villagers/NPCs, but it may give some insight to not having to do as much work if the compatibility could happen. I'll have a look into that later on, but as for first things coming I wan't what everyone would want to see in it.. I.e. the shouts, spells, etc. Thank you!! I'm gonna add an alpha release shortly once I get the bows fully working. I need some ideas for recipes; but I may just stick to simple ores for the ingots as thats how they're done in skyrim. But I may create models for the ores! I kind of wan't to release this with shouts and magic, but if its not in the first alpha itll be in the second! that is great that someone is able to make a skyrim mod and are you able to put it to 1.7.10? I'm currently going to keep it for 1.9; since there is not even a release. The whole 1.9 system would take a while to convert and by the time it would be done, everyone will be on 1.9 anyways. Btw, even though i bet its already planned, will u add new combat system, remove the hotbar(perhaps make it so that the hotbar are like skyrims hotkeys. ), make stamina not the hunger bar(so its proper stamina), make the health etc. bars dissapear when full, and add charachter customization? All of that will come in time! Hahaha I won't abandon this dont worry! It's not a custom inventory just yet; but I will be working on that when more things are in the mod. Ill take a look at the dragon shouts mod and see if the owner would want to bring it with mine! It's going to be awsome! 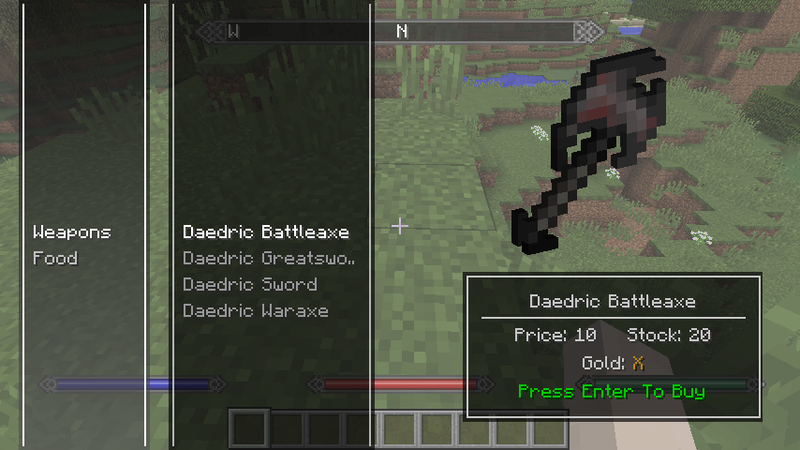 And you'll be able to do duel wielding easily with 1.9(just need to edit the offhand slot, so swords etc. in it work) and shields. Sounds awsome! keep it up!